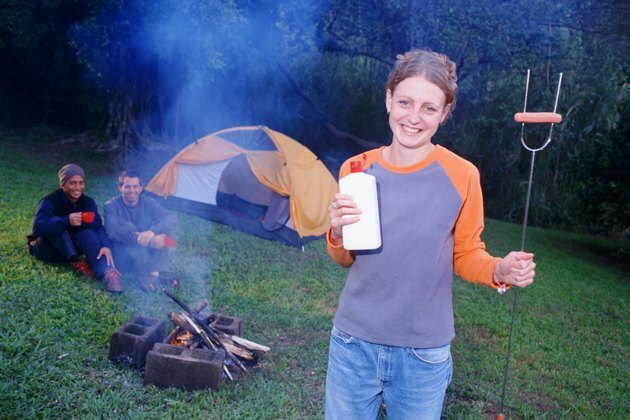 Lighter fluid and gasoline leave a putrid smell on clothing that is difficult to get rid of with regular laundering. If you accidentally spill lighter fluid on your clothing, it is important to attend to the stain immediately, so the odor doesn't set in. There are several household ingredients, like vinegar and baking soda, that will do the trick to get the odor out and leave your garment smelling fresh. Mix a 50/50 solution of white distilled vinegar and water. Make sure to read the handling instructions on your garment to determine the temperature of the water. Dunk your garment in the vinegar solution and scrub the affected area. Allow the garment to sit in the solution for 30 minutes. Remove it from the solution and toss it in the washing machine with your regular detergent. Make sure to wash the garment by itself so you don't risk getting the odor on your other clothes. Hang the garment to dry. If there are traces of lighter fluid left on the garment, you don't want to risk starting a fire by throwing it in the dryer. Fill a bucket with cold water and add half a can of Coke and 1/2 cup of baking soda. Dunk the garment in the bucket and allow it to soak in the solution for 24 hours. Remove the garment and hang it outside to dry. Once the garment has dried completely, toss it in the washing machine and wash as usual. Hang the garment to dry. Saturate the affected area of the garment with an odor eliminating spray and allow it to sit for an hour. Toss the garment in the washing machine and wash it as you normally would. Dry the garment and smell it to see if the odor has dissipated. If it has not, saturate the garment with the odor eliminating spray a second time and add 1/2 cup of vinegar to your washing machine's rinse cycle. Hang the garment to dry. Fill your sink with water and add as much laundry detergent as you would for one load of laundry. Add 1 cup of baby oil and swish the water around. Dunk your garment in the sink and allow it to soak overnight. Remove the garment and smell it to see if you can still smell the lighter fluid. If so, add 1/2 cup baking soda to your washing machine and run it. Run the washing machine again with detergent, as you normally would. Hang the garment to dry.